p.s. If you're mixing up people's messages, maybe it's a sign you (and others) should take a break from this discussion. It seems to be going in circles and it might not be worth it's time anymore. I think everyone's stated their case by now, if they haven't changed by now then I doubt they will from more argument. People who are on the fence about it might change their mind, but when a thread gets too long they might just stop reading at all, and the only people who keep reading are those who are in the argument. Sometimes it helps your case if you know when to bow out and walk away. You mean here, I guess theoratical content or political philosophical content and not "political content". Because "democratic confederalism" is accepted millions of people so and there is a so called " revolution" going on for its principles. Moreover Kurdish struggle is not just a political intitiative it is also a social existence, that people live, experince, have relations, denounce other forms of social relations etc... However for example ICC might have theoretical or philosophical content without having political power. So are you against representative democracy, if you are not how will you propose to solve it in a bigger level then neighborhoods? So real democracy only works in neighborhoods? Moreover you don't know any proof it is representative and not "real". If everyone has (though limited and small) in its commune and through it on more general councils, this is not contradicted to direct democracy. This form is the only known possible way to implement direct democracy in a larger level. When have you become Bonanno? and started to oppose all kinds of institutions? You are about to declare your war on terror I guess. Maybe kurds are against your "democracy", huh? I have quoted your comment in full here because I do not agree that it is ok for your comments here to be concealed for the reason you gave - that you were unclear who you were responding to (it doesn't matter who you addressing, when the approach you chose is to attack direct democracy). The unedited post here quoted also relates to a response I am working on which requires preparation time. My view is arguments can make people lose their head, and we all make mistakes and say things we wish we could take back. In 'real life' when we say something we regret, it can at least fade from people's memory with time. In an internet forum, the comments we regret are there forever. I've certainly put my foot in my mouth and said things I regret many times, so I sympathize with her predicament. Here is the story of why I edited out two of my comments. In the first one: I thought the comment I am replying back was mikail’s but it was actually started with Mikail then I scroll up/down a little bit I guess without notice and continue replying to boomerang’s. As I and Mikail had an argument of PKK, PYD (well everything actually) I thought boomerang’s honest questions as criticisms. This was of course wrong So I said stuff like “But this is a question? This is not an accusation or criticism.” And tried to reply it back as if Mikail was implying that answers all of these questions are negative (BecauseI know his answers. Thanks to our long discussion).Then I accuse him of changing theoretical positions or developing new sensibilities that he normally seems not to care when the topic is not PKK. Which was again wrong, as I was replying back to a totally different person without knowing. So these were his legitimate sensibilities and political position there was nothing incoherent about his position. In the second one I realized my mistake and apologized and asked for an edit out. This is also a first hand account of Rojova and its autonomy experiment, although it is not stated as so explicitly. However he/she mentions it in the text. The writer mostly mentions political structures of decision making and social issues (especially the women's problems and their solutions). When you get the time do you mind telling me again? (No rush.) Thanks! There were a better description of it in somewhere in wikipedia. But what I understand is mainly this PYD was not hegemonic group at first and they signed a cooperation threaty with other parties (which are mainly Barzani) so I think the constiution is result of it. It might be written by PYD but it is written to be accepted by Barzani and so they will get support etc. and they would not just be imposing their own ideology to already plural Kurdish society in Syria. And also this is my explanation of why direct democracy is not legally recognized. Such proposal would have zero change to be accepted by Barzani, who is against all forms of decentralization. The Kurdish Supreme Committee was an interim governing body of Syrian Kurdistan, which was founded by the Kurdish Democratic Union Party (PYD) and the Kurdish National Council (KNC), following the signing on 12 July 2012 of a cooperation agreement between the two parties in Hewlêr, Iraqi Kurdistan under the auspice of the Iraqi Kurdistan President Massoud Barzani. The member board consisted of an equal number of PYD and KNC members. Zaher's article says the Social Contract (constitution) was written by the DSA. It's hard to tell from the description but I think DSA might be (at least similar to) a parliamentary form of government. I think this is different than the Kurdish Supreme Committee, because it was elected in January 2014. Does anyone know what role the Kurdish Supreme Committee plays today, if any? I don't think Patriotic Assembly of Kurdistan in Syria (the umbrella organization for 12 opposition parties) is in the DSA, because Zaher says they refuse to participate. But Zaher also said 4 other opposition parties do participate. I'm not sure if the Kurdish National Council is one of them. I found this. I recommend everyone to read it before sleeping Good night everyone! boomerang what is this from? did you talk to zaher? is this an interview with him? is this from the talk at the bookfair? is this him confirming that the DSA that was elected by the House of the People/People's Assembly that regroups the various delegates of the Tev Dem/communes movement actually operates as a representative democracy/legislative constituent assembly like i was wondering in my article for Ideas & Action? The Highest Council, or Parliamentary Democracy? While in many areas the Kurdish population already has decades of experience with the Kurdish movement’s concepts of women’s liberation and social freedom, here too there are of course also divergences. Some wish to organize in classical parties rather than in councils. This problem has been solved in Rojava through a dual structure. On one hand a parliament is chosen, to which free elections under international supervision are to take place as soon as possible. This parliament forms a parallel structure to the councils; it forms a transitional government, in which all political and social groups are represented, while the council system forms a kind of parallel parliament. The structuring and rules of this collaboration are at the moment under discussion. By the way, Do you understand that in the article in new compass, the phare: "Some wish to organize in classical parties rather than in councils." actually refer to people who support Iraq Kurdistan related parties and thus refused to participate in direct democracy structures linked to PYD ? Zaher actually make interviews with members of such parties in his report above. You understood that correctly right? yes i wrote that, it is signed K.B. and yes i do understand this. its not a good development. don't hold up the DSA and the social contract as a good thing then, if you support the councils/communes from below... it is unclear if there are any class forces or if even those are cross class but as my article states it'd be better to support those and potentially more anti-statist women's initiatives than parties parliaments and para-militaries. So, Ok I did not know it was your signature, I will recognize it in the future. Thanks for your efforts. I agree with you it is not the best solution however if they would abolished all other parties and "force people to be parts of direct democracy mechanisms" this would inevitably will be understood as they are not democratic at all by the wider society. Their ideals of democracy would be seen as hypocrisies. I think this situation had an affect on the final decision to form a dual government organization one on transnational representative level and other on local, on Canon level. Though it is still a mistery for me: how this structure will be affected by the Duhok Agreement for example. why would not establishing a parliament be analogous to abolishing heterogeneity within the council movement? overal it seems the PYD has abolished other parties in both, but there can still be "civil society" politicians in the DSA? 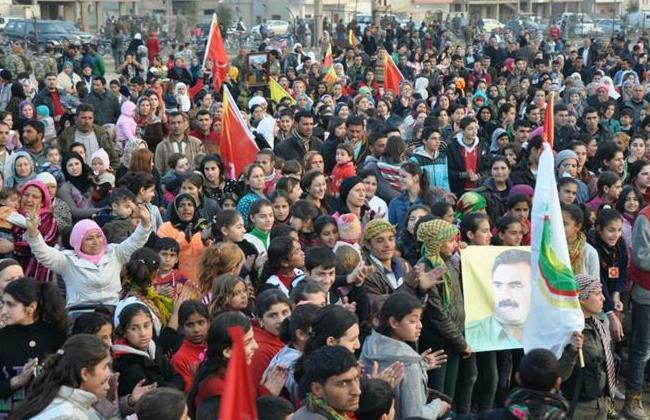 Because the councils are not firstly a movement in a social sense that appeared out of nowhere, they are parts of political aims of PYD/PKK and not those of other Kurdish parties ( this situation is similar also for other current progressive stuff in Rojova like: "real" gender equality, decentralized forms of government, forming a multi-cultural unity rather than a national one etc...). And definitely Iraq Kurdish parties felt it like this, that is why they opposed to it and refused to participate in them. So they (Direct democracy mechanism/councils) are "probably" organisations/mechanism independent of PYD but also at the same time part of its political influence and power in a very real sense. (just as the empowerment of women, benefits the PYD as well, similar examples can be multiplied). However I would really wish to learn what does this new Duhok Agreement mean for direct democracy, for example as now there is agreement on keeping Rojova autonomous among Kurdish parties. Does that mean would Iraq Kurdistan parties now will participate in local councils etc (thus effectively reversing their previous political position) ??? Or would it have the opposite effect of nationalizing the inter-canton government. Why do you think so? I think they are already part of it. however they always accuse PYD and YPG for not being democratic. I do not know for sure how this agreement will help them keep PYD and YPG in line (if they wished so they could act democratic to KNC in the first place) what will this change? How it wil effect the current situation it is hard for me to predict. however I think it is mostly a question of who win on the table. No what I am saying is you have a reading problem.